I made them!! 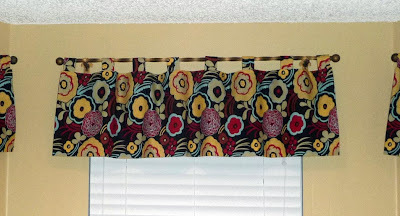 I ran out of quilt batting and couldn't finish the last two quilts so I made my Valences. I have been planning to do this for way too long. I was going to use another fabric but when I bought this Alexander Henry fabric to use for the kitchen towel gifts at Christmas, I realized it was perfect for the kitchen. It has all the colors I love. I'm so excited about them, I love them!! You can kind of see the old ones in this shot I just copied them exactly so I didn't have to think too much about it. They're done, I'm happy!!! Love the fabric. And the valances look great! I love having projects finished! those are great valances!!! I love that fabric!!!! so cute!!! they stand out way more than the other ones!!! good job! !